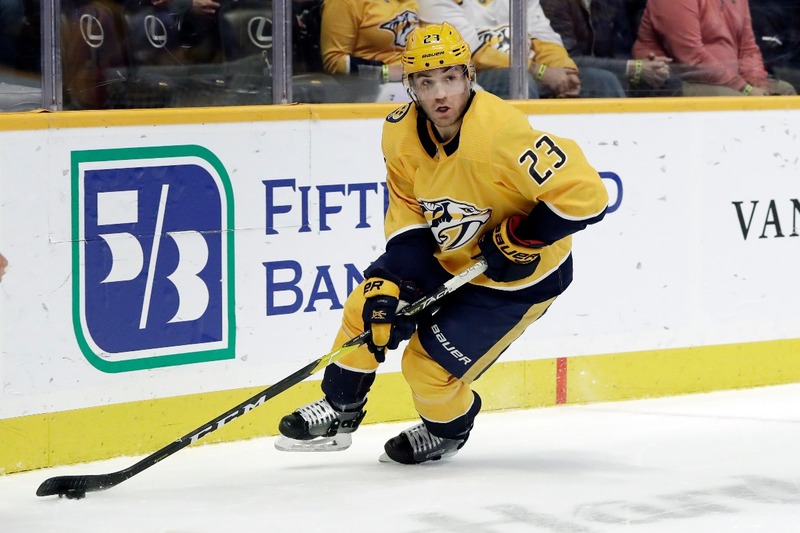 Nashville Predators center Rocco Grimaldi wasn’t expecting to play in Game 2 of the Predators’ series against the Dallas Stars on Saturday night. He hadn’t appeared in a game since March 23 due to an upper-body injury and only got into the lineup because of a teammate’s illness. Unfazed by the situation, Grimaldi scored Nashville’s only goal in regulation to tie the game at one in the second period. He was also on the ice for teammate Craig Smith’s game-winning goal in overtime. “I hadn’t played a playoff game in four years or whatever the case, and I only played a couple then, so basically, I’d been waiting my whole life for this,” Grimaldi told The Tennessean. Then, in Monday night’s Game 3 in Dallas, Grimaldi found the back of the net again. He staked the Preds to a 1-0 lead 3:29 into the second period, and they went on to win 3-2. Drafted by the Florida Panthers in 2011, Grimaldi has spent most of his career bouncing between the AHL and NHL. He contributed five goals and eight assists in 53 games for the Predators this season, all career highs. Grimaldi’s relationship with Christ has provided encouragement as he works to secure a full-time spot on an NHL roster. Growing up in a Christian home, Grimaldi accepted Christ into his life at age 4. When he was 7, he asked his parents if he could be baptized. Grimaldi sees the adversity he’s faced as part of God’s plan for his life. The Predators travel to Dallas for Game 3 of the series Monday at 9:30 p.m. ET.